Driving down winding Hollidge Hill you realize that you are approaching a rare find. 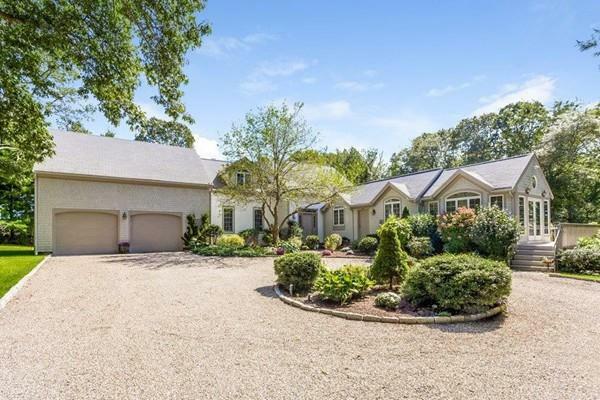 With water frontage on two of the most beautiful crystal clear ponds on Cape Cod, this spacious property will delight! Private one plus acre lot with lush landscaping and lovely exterior entertainment spaces. Enjoy swimming, kayaking, fishing and sailing from one of two docks on Hamblin and Middle Ponds. The interior of the home offers an excellent design and floor plan which has nice flow for entertaining as well as intimate private spaces. Two fireplaces, hardwood floors, multiple level outdoor decking, patio, two car garage, central air plus a finished lower level (walkout) offering private guest or in law space. All in an idyllic, peaceful setting. The neighborhood is made up of equally fine homes. Listing courtesy of Debra Caney of Robert Paul Properties, Inc. Listing provided courtesy of Debra Caney of Robert Paul Properties, Inc.